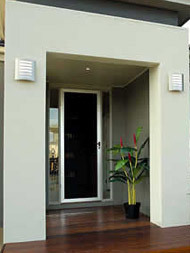 Burwood Shutters offers a range of stainless steel mesh security products for windows and doors that provides complete protection without compromising your lifestyle. Security without bars or grilles enhances your homes appearance and allows you to take full advantage of the outdoors. A foolproof security frame with a black powder coated, heavy duty woven stainless steel security mesh provides integrated protection against intruders and insects. The mesh and frame are locked into an integrated security system that is very durable and corrosion resistant. The mesh also filters out harsh UV rays reducing glare and fade. It boast tremendous fire retardant qualities together with protection against severe storms. These strong qualities rigorously hamper cutting, battering and other forms of attacks. The aluminium frame is available in a range of colours. Our range of stainless steel mesh is one of the strongest security product of its type on the market. © 2008 Burwood Shutters Pty Ltd.